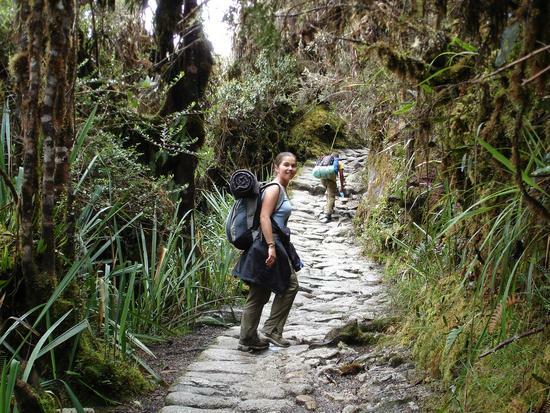 This Short Inca Trail to Machu Picchu, allows a taste of the Inca Trail with out days of hiking and camping. We begin the hike from the train stop at Kilometer 104 and follow the trail for six hours to the spectacular view of Machu Picchu from Inti Punku, The gate of the Sun. From here we descend into the world famous “Lost City”. After a restful night in a hotel, We return to Machu Picchu at dawn to see the ruins in perfect morning light. In the afternoon, We return to Cusco by train. Rental sleeping bag (optional): $35 (includes sheet liner). We provide mummy-style winter-weight synthetic-fill sleeping bags, with sheet liners. We launder the liners between each trek. Rental sleeping bags should be requested well in advance of your departure. If you are taller than 6 feet, please request an extra-long bag. Airport departure taxes: US$5 for domestic flights in Peru, and US$30.25 for international departures. In the cities, you will find sufficient vegetarian choices in most restaurants. We serve a variety of freshly-prepared foods in our camps. While our trek meals are designed for omnivores, we are able to satisfy most restricted-diet passengers. Strict vegetarians will have to bring many food supplements from home, as specialty items are unavailable in South America. If you have food allergies you must detail these on your trip application when you register for your trek. Review these with our guide and operations staff during the trek orientation meeting. Our approach in meeting the needs of restricted-diet passengers is the same: while our cooks concentrate on providing the main meal, they can heat and serve food supplied by the passengers that the passengers deem safe. If you have a restricted diet, please ask for our memo detailing our approach to food service on the trek. There are many trek outfitters in Cuzco, offering Inca Trail packages in a considerable range in quality, reliability, and price. As one of the best tour operators in Peru, we are very proud of our record of environmental and social leadership. We set the standard of quality among full-service outfitters. When purchasing your Inca Trail services from overseas agents, be certain you are buying the services operated by Sun God Peru. Accept no substitutes! We receive frequent inquiries from travelers desperately seeking Inca Trail trips at the last minute after the companies with which they originally booked “cancelled” their treks. This appears to be yet another example of lowball trek operators attempting to capture market share without backing it up with reliable trail permit management. Unfortunately, in these last-minute circumstances we can do little since the supply of trail permits is strictly limited. We invest substantial manpower toward ensuring that our rosters and permits are in good standing. Etiquetado adventure tours, inca trail, short inca trail.